Government (by which I actually mean The State) is "real" in the same way astrology is "real". They both exist as a collection of related beliefs. No one can doubt that the beliefs exist and this belief has effects. People truly believe in them and will argue about their "reality". They can point to the horoscopes in the newspaper or online, to the jewelry created in the form of the various astrological signs, to the "laws", and monuments, and giant buildings full of people. But those are just indications that people believe in these things and act on their belief, not that there's any concrete reality beneath the beliefs. People actually alter their behavior based on their beliefs in these things. People choose who to date based on astrology and choose people to kidnap, rob, and murder based on government. But the beliefs are equally stupid. In the end, you have nothing but beliefs and people willing to do things based on that belief, but nothing real holding up those beliefs. Aren't you glad you aren't superstitious like those people? That being said, sometimes it is necessary, when you are speaking to the believers, to refer to the thing as if it's real in order to point out the flaws in that system of belief. This way you can show that it doesn't actually work as advertised-- although they probably won't listen. I am beginning to understand why it's hard for you to be in a relationship. I'd guess that you need a Darwinian atheist who believes in nothing except herself and has for her religion a belief that we descend from apes. Those girls are probably out there, but they are few and far between. My belief is that government is trying to take the place of God and doing a pretty good job of it, especially with Christians. Having said that, I'm already sensing that you think my belief in God is "stupid," as you have said about a belief in astrology. So, I won't reveal more about my beliefs right now. That said, I enjoy reading your views on government and individual rights, which I believe are given by God. I'm learning a lot by reading your blog, despite my supposed stupidity. 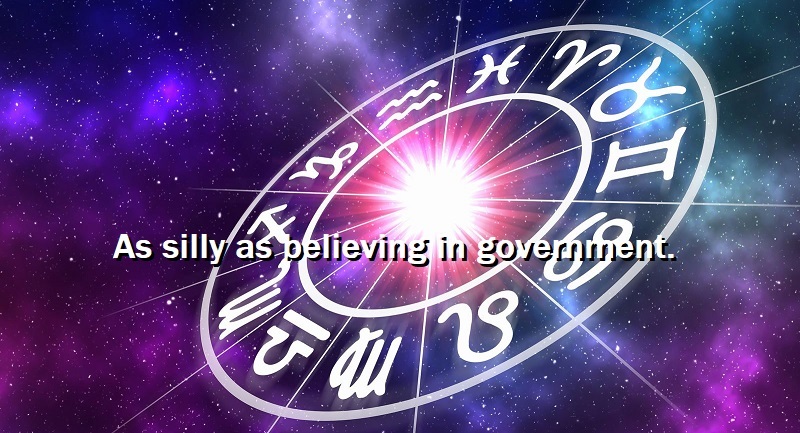 The analogy is valid but of course the two examples (astrology and government) are different in a vital way: one represents misguided, but voluntarily chosen behavior, while the other represents criminals with guns robbing and micromanaging everyone unfortunate enough to live near them. adult, and C) this is his blog, not mine. Speaking for myself, if you want to believe in a god, go right ahead. follow, to my body, or my life and relationships. point violating my right to self-ownership, and my free will. way a violation of your right to believe whatever you want to believe. evidence, and even in the face of evidence to the contrary. Thank you for the quote--it's interesting. Religion is a human-made entity; therefore, it's far from perfect. And yes, it is certainly being used (and has been used) to enslave. If you will read my writing more carefully, you'll see that I did not claim to be a Christian within what I said, although I do claim to be one. I've done a lot of research into a lot of things and I feel comfortable calling Christianity home. Your beliefs are your beliefs and I respect them. I am married to someone who claims to be an atheist--not all Christians "evangelize." I would suggest that you do more research on Darwin. If you're going to place your beliefs in one man's theory, you might want to pick a different man. But you might want to stay with Darwin and the religion of science. I have a degree in mathematics and took physics and chemistry; so, I'm familiar with the scientific method. As good as it is, I don't put all my faith in everything that claims to be derived from it. Like most things, science started out with good intentions, but try getting a climate-change believer who blames the proletariat for destroying the planet to look at a study that does not support his or her belief. You'll see some religious fervor. I sure hope that Christians aren't the only ones seeing how science has been made into a religion. For KentForLiberty's sake, it's good to know that there are lots of Darwinian atheists. Maybe you and KentForLiberty can exchange e-mails, or you can introduce him to some of your friends. previously defined in said post. made six thousand years ago, I would throw evolution out the airlock. claims made, but saying something does not make it so. force them to think. Nor would I wish to. before bringing up a subject such as this in a public forum? thank you to stop concerning yourself with Kent's love life, or mine. either one of us on that issue. This discourse is at an end. I'm out of troll food.